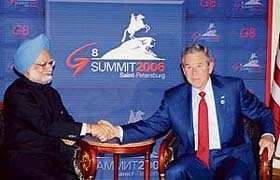 President of the US George W. Bush today assured Prime Minister Manmohan Singh that there would be no shifting of goal posts with regard to the Indo-US nuclear pact and that they would ensure that New Delhi would not be required to meet any expectations beyond those already spelt out in their joint agreement of July 18, 2005. Prime Minister Manmohan Singh with US President George W. Bush during a meeting on the sidelines of the G-8 summit at St Petersburg on Monday. Should the Indo-Pak peace process be put on hold until terrorism has been curbed? Although the G8 summit of industrialised countries was predictably preoccupied with the escalating violence in the Middle East, India was able to persuade the world's most powerful leaders to look beyond the region and denounce the recent terrorist incidents in Mumbai. The growing ability of Pakistan to export jihad and jihadis all over the world, not just India, is turning the heat on the Islamic nation from the international community. A two-metre-high tsunami crashed into beach resorts and fishing villages on Indonesia’s Java island today, killing at least 86 persons, leaving scores more missing and sending thousands fleeing to higher ground, witnesses and officials said. A high alert was sounded in the Andaman and Nicobar Islands and West Bengal following an earthquake struck beneath the Indian Ocean off the coast of Indonesia around 1.49 p.m.
For the socio-economic uplift of the community, Muslims of Punjab, Haryana, Himachal Pradesh and the Union Territory of Chandigarh here today formed the United Progressive Muslims Front. The doctors of the All-India Institute of Medical Sciences in their face-off with Health Minister Anbumani Ramadoss on anti-reservation agitation issue today got partial relief with the Supreme Court directing the government to pay them 15-day wages up to May 30, a day after the order for ending the agitation was passed.